This is a preview of a research report from Business Insider Intelligence. To learn more about Business Insider Intelligence, click here. Current subscribers can read the report here. Trucking, which can be perceived as the lifeblood of global economies, has experienced healthy growth in recent years due in part to surging e-commerce shipments. In the US alone, trucking accounted for over $700 billion in revenue, representing a 3.5% increase year-over-year (YoY). However, to maintain its stature, the entire industry — truck manufacturers, fleet managers, and other logistics companies — will have to transform to meet the demands of the future. 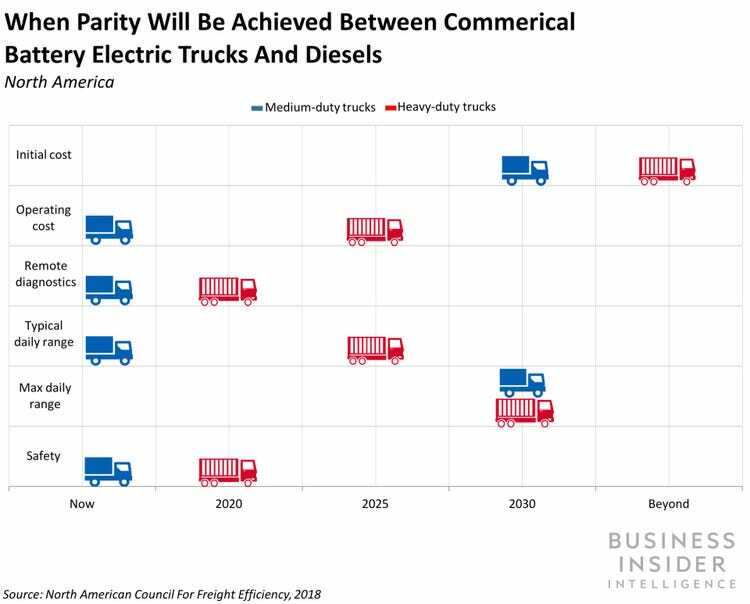 As a result, the trucking industry is in the early stages of a technological shift, with a particular focus on transitioning fleets from diesel to electric energy. While electric trucks (e-trucks) are not an entirely new concept — they’ve been around in some form for over a century— three key factors are renewing focus in the technology: government-mandated reductions in carbon emissions, the rising total cost of fleet ownership (TCO), and heightened investment in e-truck infrastructure. As such, the industry is seeing many any high-profile companies already investing in commercial e-truck technology: For example, Daimler, the parent company of Mercedes-Benz, is plowing $3.2 billion into the research and development of e-trucks over the next two years, and Volkswagen will invest $1.7 billion in e-truck and bus technology by 2022. And leading logistics companies are following suit, increasingly incorporating e-trucks into their operations: UPS announced that it will collaborate with Workhorse Group to deploy 50 electric delivery trucks, for example. 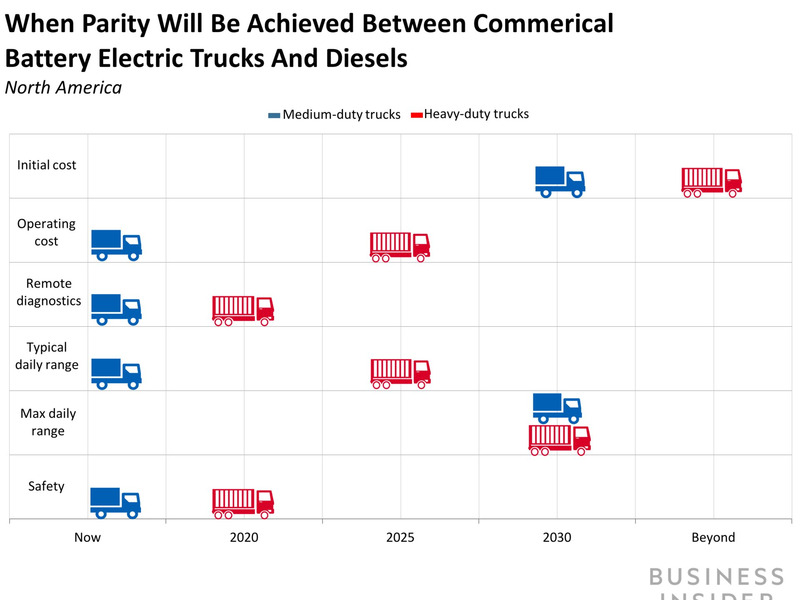 In The Electric Truck Report, Business Insider Intelligence will size the e-truck market and identify the core drivers that will lead to e-truck adoption. We also discuss which segments of the trucking industry will be early adopters and profile the players expected to take on a prominent role in the future of e-trucking. Finally, we look at what manufacturers and logistics companies will have to do to not only advance the market but also prepare for the operational changes that come with deploying new technology. The companies mentioned in this report are: Anheuser-Busch, ChargePoint, DHL, Daimler, Element Fleet Management, FedEx, PepsiCo, Tesla, UPS, Volkswagen, Workhorse Group, and Vion. The trucking industry is transforming from diesel fuel-based to electric-powered, and the e-truck market is expected to climb at a 30% compound annual growth rate by 2026 as a result. Automakers and logistics firms are turning to e-trucks for three reasons: a global push for stricter emissions regulation, rising TCO, and increased investments in the e-truck infrastructure. In the near term, e-trucks will be most useful for short to medium-length trips, like urban deliveries, carried out by Class 3 to 6 vehicles. A network of companies — automakers, logistics firms, and charging startups — are making shorter-distance trucks a reality while laying the groundwork for long-haul e-trucks to become viable. E-trucks will eventually become the norm for the trucking world, but not without significant work on the part of truck manufacturers and logistics companies. Identifies and explains the factors that will be core in rising e-truck development and adoption. Details what some of the leading manufacturers and logistics companies are doing to improve their e-truck offerings and solutions. Pinpoints where early adoption will occur and what will need to happen for all e-trucks to become viable options for other logistics companies. Outlines what manufacturers and logistics companies need to do in order to take full advantage of a market that is poised to grow as market pressures only continue to increase going forward. The choice is yours. But however you decide to acquire this report, you’ve given yourself a powerful advantage in your understanding of the fast-moving world of electric trucks.